The PHP team has released upgrade version 7.2. Which has a number of changes and improvements than over version 5.X. 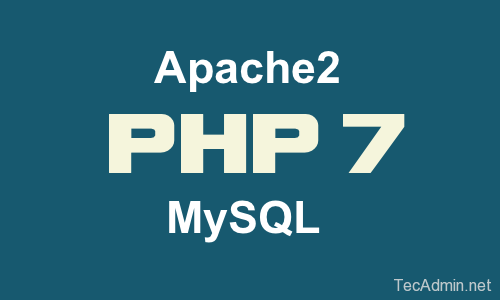 This article will help you to install PHP 7 Apache 2.4 and MySQL 5.6 on CentOS/RHEL 7 & 6 operating systems. This tutorial has been tested with CentOS 7.4, so all the services command are used with systemctl. The CentOS 6 users change all systemctl command correspondence service command. In the first step install all the required yum repositories in your system used in the remaining tutorial for various installations. You are adding REMI, EPEL, Webtatic & MySQL community server repositories in your system. Now install php 7 packages from webtatic rpm repository using following command. Now install required php modules. Use following command to list available modules in yum repositories. Now check all listed modules in above command and install required modules like below. Apache (HTTPD) is the most popular web server used on Linux systems. Let’s install Apache web server using following command with enabling epel and remi yum repositories. In step 1 we already have installed required yum repository in your system. Let’s use the following command to install MySQL server on your system. If you want to install MySQL 5.7 visit this tutorial. Now restart MySQL service and enable to start on system boot. Finally open firewall ports for HTTP (80) and https (443) services using the following command. Let’s check the installed versions of packages on system using following commands one by one. Now you have successfully configured LAMP setup on your CentOS / RHEL 7.4 & 6.9 systems. Should I add any config to httpd.conf? Apache downloads php files instead of displaying it! on topic 3 ( # systemctl enabel httpd.service ) enabled is typed wrong! This won’t work for Centos 6, just as it’s never worked before. Neither remi or epel offer a php-package without forcing the installation of apache 2.2 from base. Anyone know of a repo that offers both apache 2.4 and a php >= 5.6 for Centos 6? the above installed Apache 2.2 for me. I could get 2.4 to install via epel’s httpd24 package, however the php70w package is compiled for 2.2 and therefore errors out when php tries to hit the old apache apis. Same issue as you described here! A bit late but you can use the ius-release.rpm or centos-release-scl repositories. (Google them for rpm/install commands) SCL allows for both Apache 2.2 and 2.4 to be installed without conflict, while IUS will conflict with the core binary dependencies.